Inspired by a broken McLaren recently, we've scoured the internet to find the biggest car fails - by dealers, racers and professionals - where a clever plan went completely awol! Some people look after their cars. Others shouldn’t be allowed anywhere near them, so it’s surprising how often the latter group ends up in charge of seriously expensive cars (including this guy who broke a McLaren by accidentally reversing it with its door open!) only to drop the ball in spectacular fashion. So kick back and grab the Doritos, because we’ve compiled a list of our favourite vids where the ‘professionals’ should have known better than to screw up like this! Kamui Kobayashi was never an official Ferrari F1 driver, taking the wheel of a 458 GT racer in 2013. He actually showed some good car control on the way to a team 5th place in the same car at Le Mans that year. It’s amazing he even got the chance, though, because in 2010 the Japanese star dumped one of Ferrari’s F1 cars into the barriers in Moscow. Click to 1:20 for the action. Don't stand in front of a moving car...even a clever Volvo! As Ron Burgundy knows, there are lots of things you can do to impress your co-workers. Two guys outside this office decided to prove their mettle by standing in front of a Volvo equipped with a pedestrian detection system linked to automatic braking. Needless to say it didn’t work. Way to go, Casanovas. We laughed hard at this one. At what seems to be a North American tribute to the 1000 Miglia a beautiful old Ferrari arrives on stage and claps its brakes on. It’s a pity nobody secured the flooring properly, of course, but we’ll award maximum points for the hilarious synchronised falling-over. 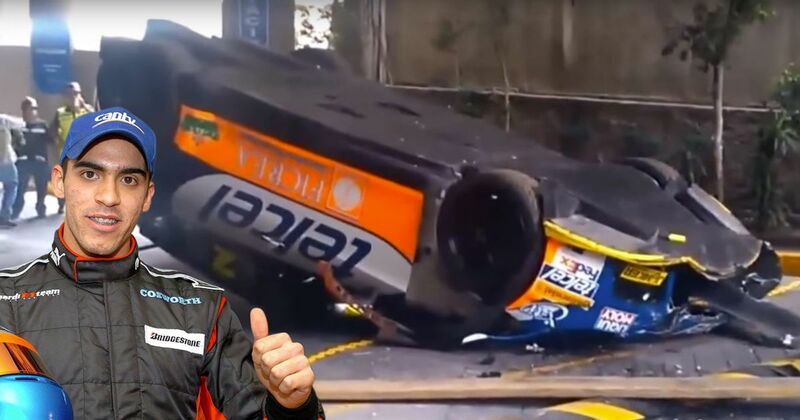 This is a list of crashy fails, so it wouldn’t have been complete without this beauty from our good friend and supplier of YouTube funnies, Pastor Maldonado. At a special display event in Caracas, the Venezuelan driver’s capital city, Crashtor steams into view on the dusty surface, loses the back end and slams into a kerb. Oh dear. It would be easy to get caught up in the question of why an old Renault F1 car is racing a Ford GT. But by the time you’ve started wondering, the duel in this clip has started. And finished in disaster. Seems there’s not a lot of grip at the back end of the Renault, and from the noise the car makes the throttle might have stuck open. Either way, the Ford is lucky to escape being caught up in a dramatic smash that tears the yellow F1 legend apart. And who could forget this all-time classic? Picture the scene. You’ve got to shift a rather expensive Seat Leon Cup Racer to an upper floor for some rich and/or powerful executive. So you load the car onto the platform, engage the handbrake, tie it down at all four corners, maybe add a bit of ballast and get on with it, right? Wrong. So wrong.